Tell me a little bit about your situation before working with Leslie and her team. What led you to want to seek out some guidance? My husband was involved in an affair that was going on for 5+ years. He was continuing to lie to me, constantly trying to make me believe that he was getting out of it. It was a horrible situation and I was not equipped to deal with it in a productive way. I was completely falling apart and it was destroying me and my family. My daughter had attended a conference that Leslie spoke at and she bought her book for me. After reading the book I realized I desperately needed help to deal with the situation. I contacted Leslie and was fortunate enough to be accepted as a client. How did you find out about Leslie and her team? What were your first impressions of them? As mentioned above, it was through my daughter. After reading the book, I believed that they had the tools I needed to come through my situation in a Godly manner. I was so thrilled to be accepted. How is your situation changed since working with Leslie and her team? What positive changes have you made. Where do I begin? First of all, understanding the manipulation and emotionally destructive abusive behavior was such an eye opener. The truth that the lies my husband was telling me weren’t not nearly as destructive as the lies I was telling myself was life changing. I realized that I continued to accept his lies because I wanted to believe them. I finally began to face the reality of the situation. I loved that I was given a recording of each of our sessions. I listened to each one and actually transcribed them so I could go back and work through them. I needed to remind myself constantly of the things I was being taught to do. Leslie and her team gave me the courage to file for divorce, which was granted 2 years ago. What were some of your biggest “ah ha” moments while working with Leslie and her team? The lies my husband tells me not nearly as damaging as the lies I tell myself. I really struggled with control issues. We would get into screaming matches. Leslie’s team taught me some ways to walk away and not get involved. I was struggling at work with concentrating on my job. They helped me learn how to overcome that. 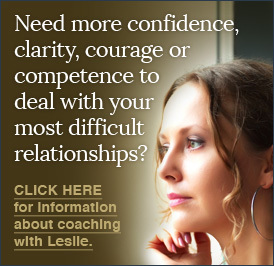 I liked that Leslie ‘coaches’ rather than counsels. Our conversations were a useful tool to look honestly at the situation and do worst case scenario and face it. Once I was able to face the worst case scenario and come up with a plan around it, I was able to deal with it. I cannot tell you how much that has helped in so many situations. I’ve also shared that with others and it has really helped them as well. Any tips you would give to someone in a similar situation? First of all – read Leslie’s books. Then if at all possible sign up for coaching or at least do the group counseling. Don’t wait 3 years into it like I did. Do not expect the situation to change. Don’t allow him to put it on you – it is not you. Don’t get embroiled in the trash. Don’t get into it with either him or her – particularly not her. Proverbs 15:22 – listen to the wisdom of wise counsel. However, be careful who you listen to. One of the many things I appreciated about Leslie – she did not tell me what to do. She laid out options and made it clear if I stay, to stay well – and gave tools for survival.